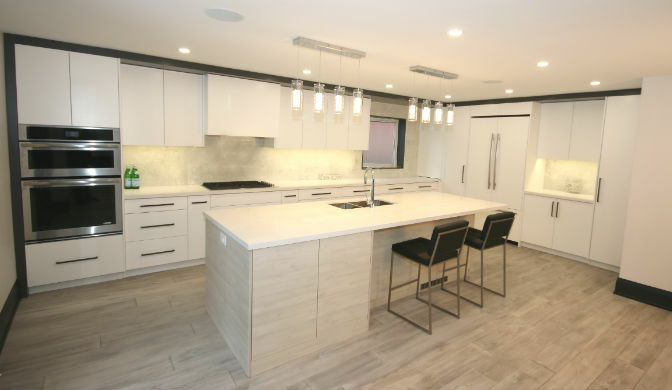 This Oakville modern kitchen was a great home renovation that transitioned a 30+ year old home into a more modern look and feel starting off with this home's new signature white modern kitchen. You can see that the kitchen incorporates white flat panel cabinetry with modern cabinetry panels for the kitchen fridge doors. This modern kitchen has a stunning oversized kitchen island highlighted by its beautiful Caesarstone quartz countertops. Hope you love this new modern Oakville kitchen transformation.